Subscribe to the Online Version! The March, 2019 issue of LCM Online is now available for all of our Online Members! 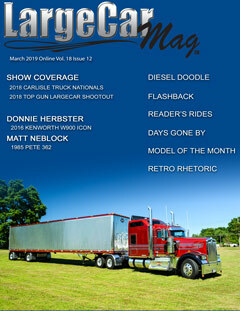 LargeCarMag is an online and print magazine that brings you coverage from as many shows as we can get to. We will bring you features on the BEST trucks in the country. We will also, from time to time, post pics from past shows. The reason we decided to start this site is first and foremost we love trucks and have for as long as we can remember. Second, is the huge lack of coverage “working” show trucks receive in printed magazines and on the web. 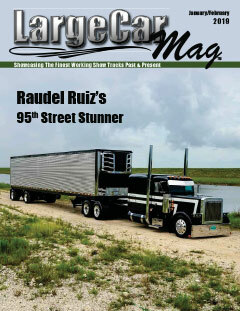 Back in 2001, we were the originators of bringing truck show coverage to the web in an online magazine. Now we are excited to also be able to offer you our print magazine! We want to bring you pictures of the trucks that get very little, if any coverage. We constantly find ourselves going through show coverage in printed magazines, wishing we could see the ALL the trucks, including those in the background. LargeCarMag solves that problem, as our online magazine shows you EVERY truck entered at the shows we attend! Our printed magazine shows as many as our pages will fit! We also have a monthly featured truck, articles on rides submitted by our readers, photos from back in the day, and much, much more! Our online magazine is updated monthly (twelve issues per year) and our printed magazine is mailed bi-monthly (six issues per year). Both are available now for subscriptions.